I have answered three questions that I think will be the main questions concerning bathtub refinishing Dallas. Bathtub refinishing is not Rocket Science, Yet science plays a crucial role. Technology has advanced ten fold since the 1990's yet I still see epoxy paint being applied to bathtubs. If Epoxy worked then other technologies would not have surpassed it. Epoxy paint will peel. It's not a question of how to prevent it or how to make it last longer it is a fact that Epoxy paint is 100% going to peel off the surface because it is paint. Paint is applied on top of the surface. Now there is some truth to the fact that higher quality epoxy paint will potentially last a little longer. At least in theory. However, to get that toughness it will have to be applied thick. So thick that it will have a blotchy look to it. Even then if it is not applied at the correct intervals it will bubble because epoxy paint is a two part mixture and then it has thinner so it will level and flow and even the thinner can be a simple lacquer thinner which contains alcohol that causes it to dry quick and brittle or other brands that have contaminants that cause the coating to fish eye or become splotchy or dry uneven so some areas dry in 5 hours and some in 24 hours! This is why if you go look at lacquer thinner you will see prices all over the board and if you are looking for a cleaning agent then honestly any lacquer thinner will work in other words, to clean equipment and spray guns. Inexpensive lacquer thinner causes gasses to be put off so if a layer of epoxy is put on too close to the last layer the gasses can not escape and an air bubble will form causing the epoxy to bubble and detach from the surface. 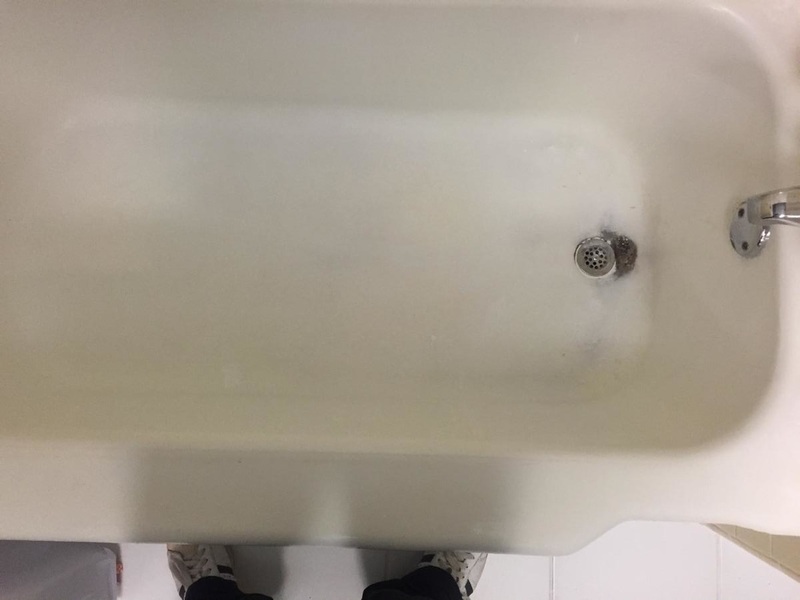 When it pops, usually about a day you have a flaky mess to get down the drains, come off in the bath water and not to mention epoxy will turn yellow when bleach is used to clean it. It is not a two part agent, instead it is a 6 part agent that is customized to surface it is being applied to. It does not yellow and it will not peel off because it is integrated into the old surface, not painted on top of the old surface. This gives it the ability to be a permanent solution, not a quick fix! Please don't be fooled by the inferior epoxy bathtub painting kits sold in home improvement stores. 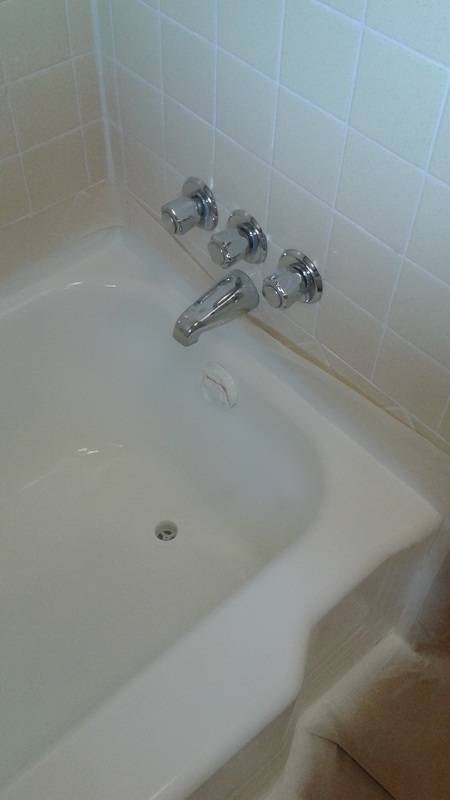 There is a night and day difference between bathtub refinishing and bathtub painting. When I etch the top glaze off the fixture being refinished then hand rub my molecular bonding agent into to pores that were created by the etching process it allows the synthetic porcelain finish coat with liquid glass and fiberglass resin to integrate into the old surface. NOT on top of the old surface. This makes it impossible for the new surface to peel, impossible to fail. Failure is not an option™. Bathtub, shower and tile refinishing is an excellent way to not only update your bathroom and your home, but also add value to your home. With the new generation of synthetic porcelain coatings bathtub, shower and tile refinishing has become a permanent solution instead of a painted on quick fix. If you are considering having your bathtub, tile, shower refinished please keep in mind the new coating will need time to bond to the old surface. In most cases this occurs in about 24 hours. The most common complaint with bathtub refinishing is actually a complaint that has everything to do with the customer and not the refinished fixture. For example, it will look and feel dry after about 2 hours but that does not mean it is ready to use. The bonding process has not occurred yet. So when the cold, then hot then warm water hits the surface it simply changed the temperature and causes an issue with the bonding. This will result in bubbles and lifting away of the new surface. It makes it really easy to tell when a surface has been used to soon. However, if you consider the savings of the refinished fixture versus the replacement cost you will see an average savings of about 75%. Plus you eliminate the need for multiple strangers moving throughout your home and instead of taking weeks with a bunch of dust and noise, it takes about 2 to 3 hours and can usually be used 24 hours after completion. Devoted to providing the finest refinished surfaces in Dallas combined with educational material.